Placing your cooking appliances is the toughest part of planning a kitchen. Every other appliance is pretty easy. Cooking with various sizes, wall ovens, cooktops and stoves has the most variables. Downdrafts are not as popular as they were in the 1980s, but still can solve some problems in kitchen islands or replacing other downdrafts. As a rule of thumb the best way to vent is with a hood above the cooking surface. As we all know, smoke and heat rise. Hoods provide capture area to channel the smoke, whereas downdrafts do not. Having good ventilation in your kitchen is very important. Proper ventilation clears the air of smoke and odors. Ventilation also prevents particles from accumulating on ledges, curtains and cabinets. If your cooking product is in an island you have two choices. You can hang an island hood or you can downdraft. 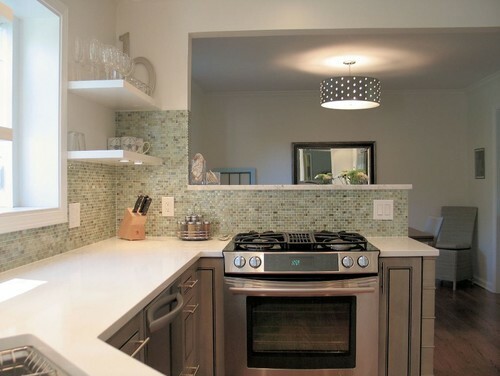 Purchasing and hanging an island hood from the ceiling can be costly. Also, the island hood can obstruct the line of sight in your kitchen. You may also be installing a cooking product in front of a window where there is no wall. This would be another prime example of where a downdraft would work best. The most common and best way today to downdraft a cooktop is with a telescoping ventilator located behind the cooktop. The ventilators are available with CFM (cubic feet per minute) from 600 to 1,200. Broan actually produces an inexpensive downdraft at 500 CFM. Jenn-Air also manufactures an assortment of gas and electric cooktops with integrated downdrafts. Rather than placing the ventilator behind the cooktop it is centrally located between the burners. They are available in gas or electric. Below is a Jenn-Air model JDG3536WS priced at $1,949. The downdraft is a 3-speed fan rated at 325 cfm. 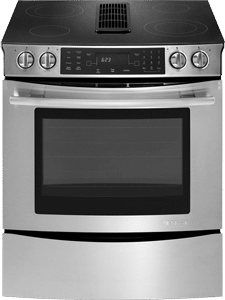 The electric cooktop model JED4536W features glass touch controls with a burner that expands from a 6 to 9 to 12 inch burner priced at $2,149. This gives you a lot of flexibility for different pan sizes. Jenn-Air also has 2 series of downdraft cooktops that have a barbeque grill integrated into the top. The grill is removable and can be replaced with another burner. They are available in a 4-burner 30 inch or a 6-burner 45 inch. The JGD8345AD is priced at $1,749 and the electric JED8348AD is $1,199. 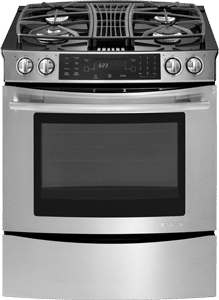 I like the Jenn-Air for replacing other older Jenn-Air cooktops, but separate cooktop and blower has better features, options, BTU output and blower speed. 20 years ago, you could buy downdrafts from GE, Roper, Modern Maid, Thermador and Jenn-Air. Jenn-Air is the last company currently producing a range. 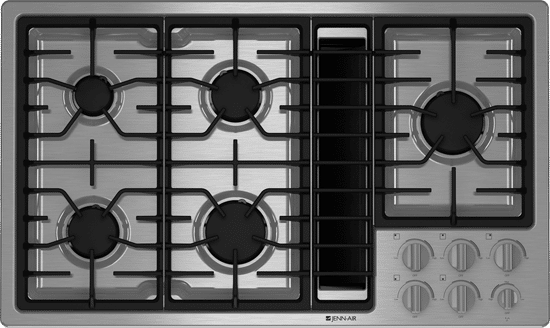 The ranges, like the cooktops, are 30 inch wide and are available in gas, electric or dual fuel. All the ranges feature convection ovens with a 325 CFM downdraft fan. The ranges, again like the cooktops, are available with the BBQ grill or without. The gas ranges all feature a 16,000 BTU max burner. Jenn-Air also offers a slide-in griddle for ranges that have the bbq grill option. The grill will unplug which allows you to slide another burner or a griddle in its place. Below are some examples of downdraft ranges. As I said in the beginning downdrafts can solve some issues, but hoods are still a better way to vent. 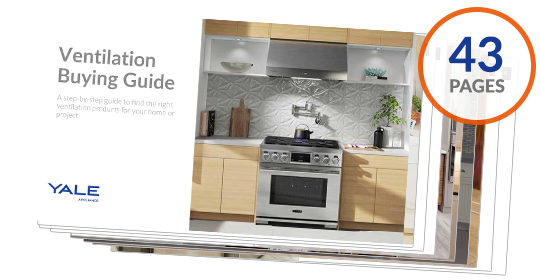 Download the Yale Ventilation Buyers Guide with features like ducting, the proper CFM for professional ranges, downdrafts and much more. Over 220,000 people have read a Yale Guide.